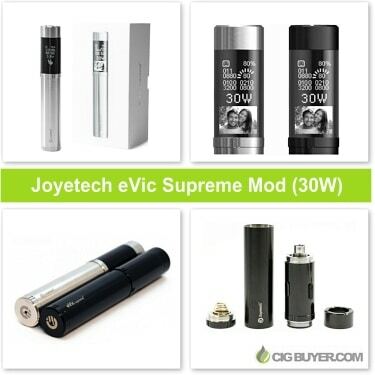 Joyetech eVic Supreme Mod (30W) – Reduced to Just $72.00! Back in 2013, the Joyetech eVic was one of the most technically advanced personal vaporizers on the market. Although it’s still available and loaded with unique features, it’s max power output is just 11W; paling in comparison to most of today’s high-powered mods. Luckily, Joyetech released the eVic Supreme, improving the popular device with upgraded software and more power – up to 30W! Firing down to 0.5 ohm and compatible with most sub-ohm tanks, it includes a feature-filled operating system and large 0.96″ OLED screen that can even display photos or a screensaver.